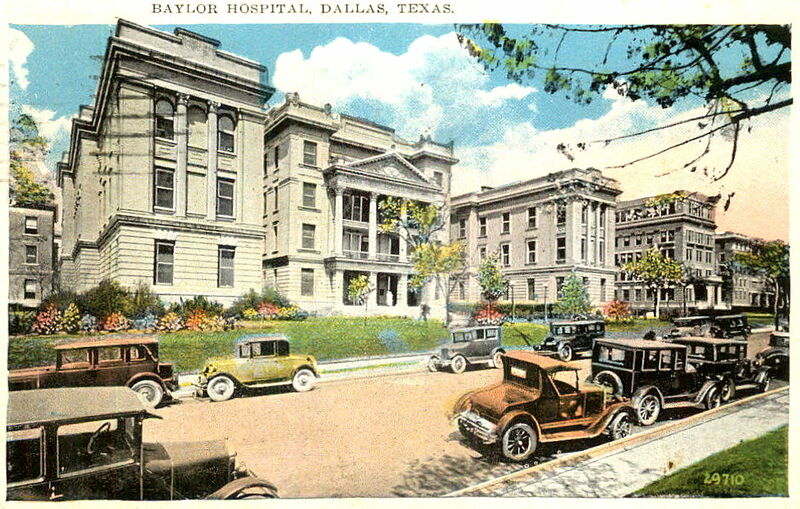 I originally thought the street in front of Baylor Hospital in this postcard was Gaston. 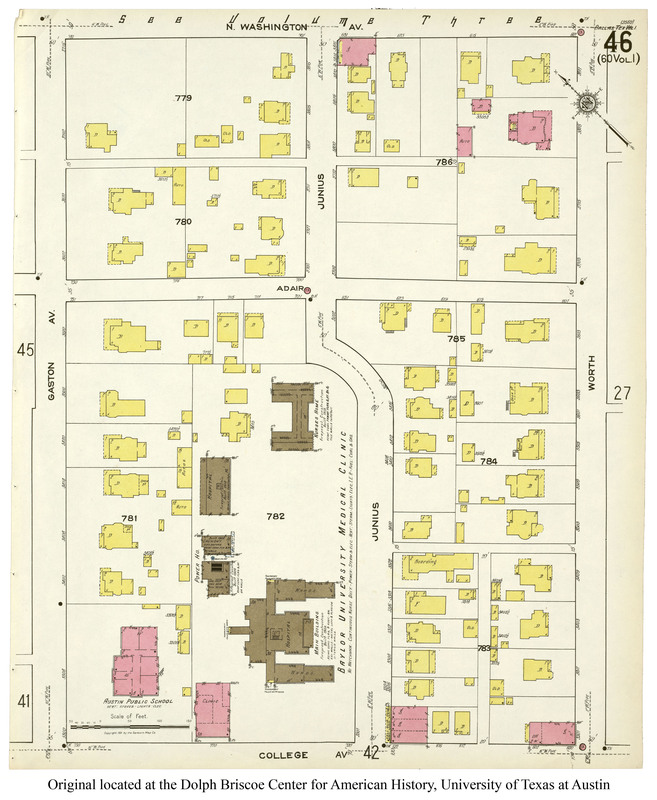 But Baylor originally faced Junius Street (see it on a 1921 Sanborn map here), and, in fact, its address was 3315 Junius for many years. I had no idea. This is my favorite one: no cars, but there’s a horse grazing at the entrance! 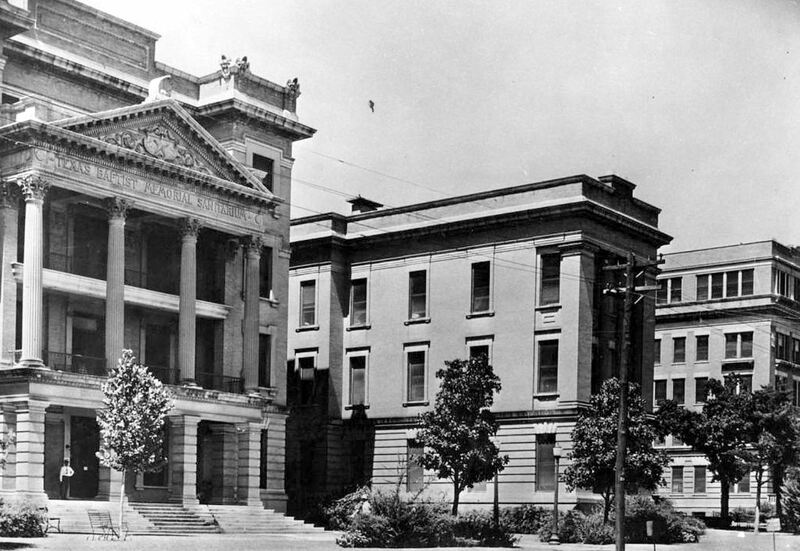 The postcard below was postmarked 1909, the year these new buildings opened. No cars, no horse, no people. 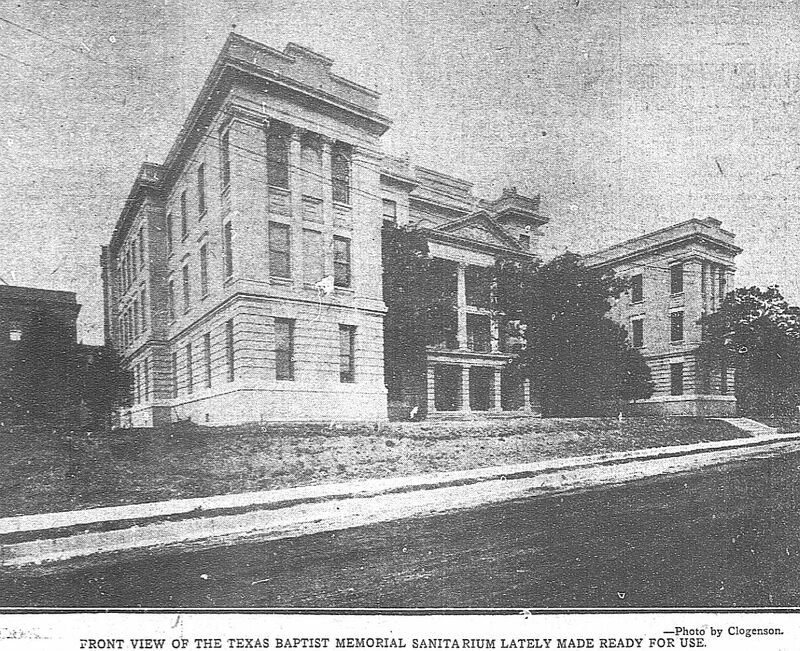 And here is the brand new sanitarium, in a photograph that appeared in The Dallas Morning News less than a month after its official opening. The first black-and-white photo is from the 1917 Round-Up, the yearbook of Baylor University in Waco; the same image (uncolorized) appears in the digital archives of UT Southwestern, here, with the date 1915. The second black-and-white photo is from the UT Southwestern Library archives, here. 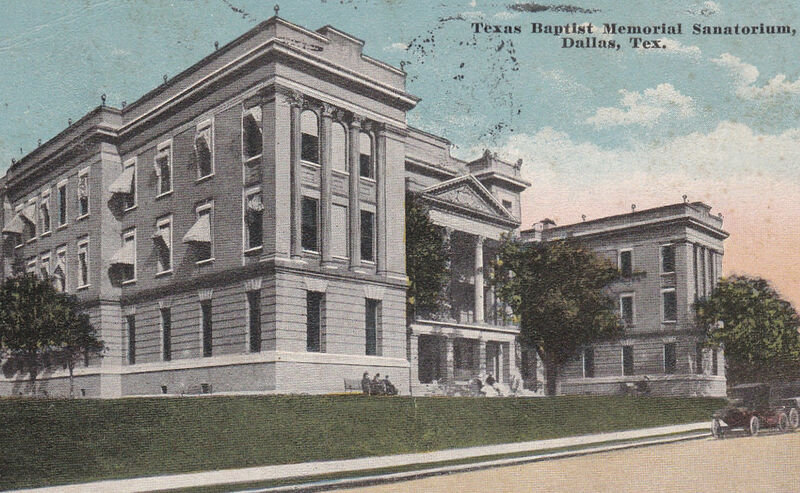 The name-change of the Texas Baptist Memorial Sanitarium to Baylor Hospital was proposed in Nov. of 1920 and formally approved by the Board of Trustees of Baylor University in Waco on January 16, 1921. 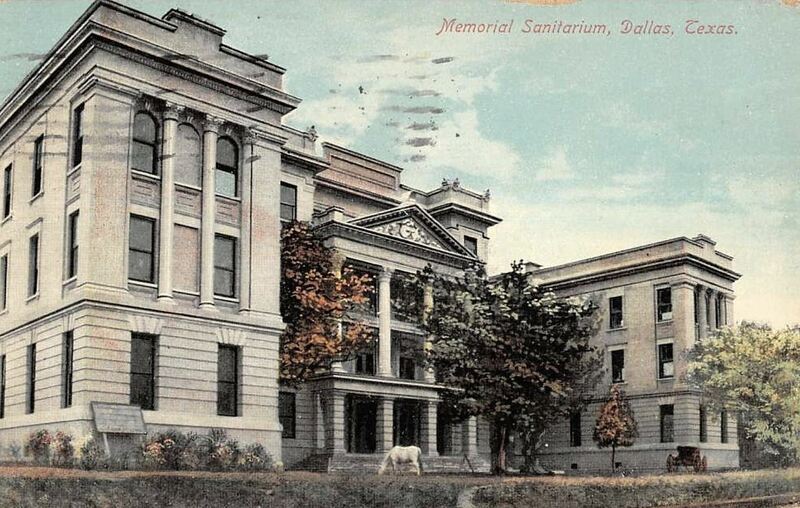 More about the major changes happening to the medical facility/facilities affected can be found in the article “Medical Center For Dallas Is Authorized by Texas Baptists” by Silliman Evans (Fort Worth Star-Telegram, Nov. 13, 1920), here. 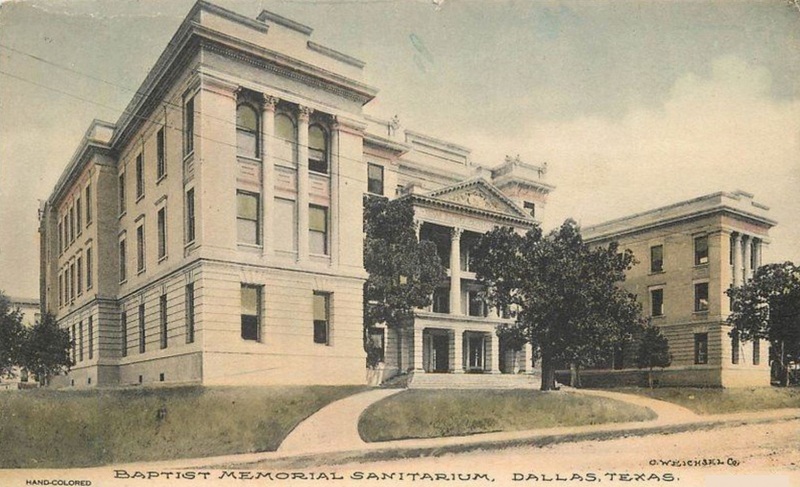 Read a detailed description of the Texas Baptist Memorial Sanitarium in the Dallas Morning News article “Baptist Memorial Sanitarium, Just Completed at Dallas, Represents an Investment of More Than Four Hundred Thousand Dollars” (DMN, Nov. 10, 1909), here and here. There are several photographs taken inside and outside (and on top of) the brand new buildings. Dating this picture to the mid-1920s is exact enough for most purposes and sufficiently vague to discourage carping and second-guessing. Though, Lord knows, second guessing is a lot of fun! The lay out was good then……modern was in decades, and the length of a decade would last longer then what we are now going through….life was in the cups transition, and the taste was good….that is the quality too be born into…..
……and the buildings on Gaston became Apartments..one by one as they were torn down in the 1950’s and 60’s……A hand colored postcard…..